1. 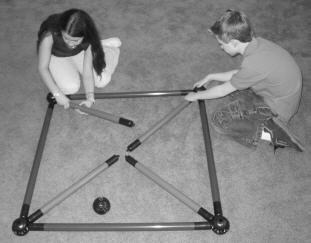 Connect four 36” Toobeez tubes into a square formation so that the multi-holed equator of each sphere is in a horizontal position. 3. Connect the four converging 24” tubes in the center with a sphere. This will serve as the base for the Toobeez hot potato apparatus. 4. Insert a 16” Toobeez tube in the top hole of the center sphere from Step 4 so that it is vertical. Attach another sphere to the top of this tube. Insert a 16” Toobeez tube into the top sphere so that it is parallel to the ground. 5. 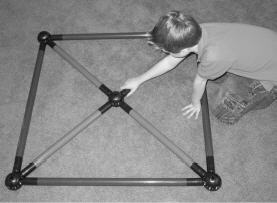 Attach a sphere to the end of the 16” Toobeez tube from Step 6. This will serve as the hot potato to be passed during game play. 7. 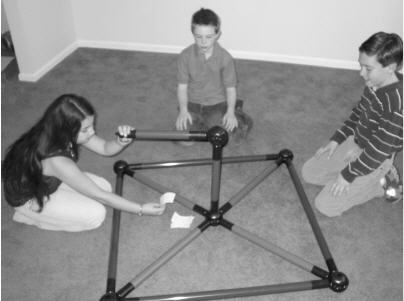 This playing deck should be placed face down in the center of the Toobeez hot potato apparatus so that it is accessible from all four sides. 1. Divide the class into four groups. Teacher Note: Each group should include students of varying mathematical skill levels. Challenge: The student groups should attempt to answer all the sample problems in a timely manner. Likewise, they should seek to learn by challenging other groups to answer problems their group finds difficult. 3. Teachers should begin by outlining the following procedure for play and rules. Teachers are responsible for timing the rounds. 4. Each round will last four minutes. Teacher Note: This can be changed depending on the skill level or the topic under review. 5. A group should be chosen to go first, and the game proceeds to the left. 6. 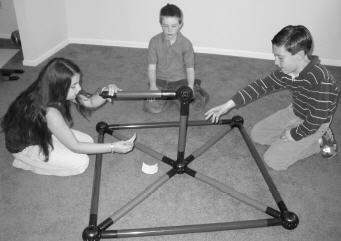 On their turn, one member from the group must always be holding the end sphere extending from the center Toobeez tube. This is the hot potato. 7. While the student is holding the hot potato, another student should draw one card from the top of the playing deck and read the problem or directions listed on the card for the whole group to hear. 9. “Skip” or “Reverse” cards should be set aside after use. 10. If a team answers a problem card correctly, they should keep that card and pass the hot potato to the next group. 11. If the team provides an incorrect answer, that problem card should be returned to the bottom of the center deck and the hot potato should be passed to the next group. 12. Challenging: If a team decides a problem card is too difficult, they can choose to challenge any other group. 13. This game play proceeds for four minutes. 16. Finally, move to the “Activity Discussion and Processing” section of the activity. How is competing to solve problems in a time-sensitive manner helpful in test preparation? Why is it useful to observe how others solve problems that you did not understand? Why are communication and trust crucial in group problem solving? Allow students to design the problem deck using homework problems which they found difficult. While designing the game deck, assign differing point values to problem cards based upon the skill level required.